Before the introduction of Taco Bell’s Nacho Fries, my biggest hang up with going to Taco Bell was their lack of fries. Since I can remember, and from what I’ve heard before then as well, fries have been my favorite food. I judge fast food and regular restaurants by the quality or lack thereof (I see you In-N-Out) of their fries. I will make substitutions if food I order does not come with fries. I have strong opinions on the best fry shapes. I have an ongoing desire to go to McDonald’s one day and eat a whole basket of fries and nothing else (around 3 large orders). So it goes without saying that as much as I love Taco Bell, when I ate there, I was choosing fast food, but foregoing the opportunity to eat fries, which always caused at least a small pang if regret if the Taco Bell wasn’t paired with a KFC or Long John Silver’s. With the introduction of their new fries, I no longer will suffer from that feeling. Without wasting any more time, let’s review into this important development. Taco Bell offers the fries as a regular side with nacho cheese, and a nachos-like portion served in two sizes: Supreme (small) and BellGrande (large). The Supreme and BellGrande versions are fries “dusted with bold Mexican seasonings [topped with] seasoned beef, diced tomatoes, reduced-fat sour cream and that warm and magical Nacho Cheese Sauce.” The Supreme size is $2.49 and BellGrande is $3.49. You can also get a box of fries with a cup of Nacho Cheese Sauce for $1. I ordered the BellGrande portion. Words can’t express my excitement as I waited for my food. I kept trying to peek into the kitchen to see when my order would be finished. After what felt like an eternity, but was probably only two minutes, I got a bag with the food. I rushed to my table to empty the contents, and my first emotion was disappointment. The size of the fries container was small in terms of both fries and toppings. I thought the BellGrande portion would be larger and I expected more toppings. At least at my initial glance, I’d rather have saved the $1 difference between the Supreme and BellGrande sizes. Getting into the actual food, these were standard fries. Coming out of the kitchen, they were crispy and looked to have an extra layer of batter on them. Obviously, they weren’t cut in the back, but they seemed to be acceptable fresher type fries. There was a small amount of spice scattered on them, but I can’t recall it standing out in any way. I’d have liked a more aggressive shake of the seasoning because I think it could have really elevated the fries. After trying to fries alone, I tried one with just some Nacho Cheese Sauce. It was standard Taco Bell nacho cheese, a little spicy and kinda cheesy, which I generally enjoy. I thought the pairing went well together and would consider the $1 fries option in the future. The fries were still crispy after a dip in the cheese and the flavor complemented the fries. If you want something plainer, and control over the amount of topping on the fries (as well as the option to prolong the crispiness), the $1 option is a good order. I then started digging into the meat of the dish, literally and figuratively. The tomatoes didn’t really add much. The BellGrande Fries are meant to mimic nachos. However, unlike chips, which have a broader base and can be used to scoop up other foods, the fries need the toppings to adhere to them. Tomatoes don’t adhere to fries at all, so I resorted to using a spork, which was a lot of effort for tiny tomato pieces that weren’t really necessary to the dish. They weren’t strong in taste nor did they have enough of a textural contrast to be there. If Taco Bell wanted to add a vegetable, I think a pepper would have worked better. The beef is standard Taco Bell ground beef. I can’t remember the last time I had ground beef on fries, but it’s a great addition and hit the marks I was expecting from the fries in terms of replicating a plate of nachos. In addition, not that I wanted the Nacho Fries to be filling since I was ordering a lot of other food, but if you were looking to make the fries a focal point of your meal, then the beef adds some heft to the plate. After a few bites, I realized I needed a utensil even when I wasn’t trying to eat the tomatoes. The fries were getting pretty soggy and messy, and using my hands didn’t seem to be a viable option anymore, especially since I was taking pictures and notes. Using the spork also let me mix and match bites to try out different combinations and prevented the fries from getting boring by replicating the same bites throughout the meal. I’ve complained before about food getting boring, but the choose your own adventure aspect here let me pick around and choose the best bites, which usually was the fries with the Nacho Cheese Sauce and some ground beef. I’m not a big fan of sour cream and don’t really need it on my nachos. The sour cream did nothing to persuade me to eat it more in the future. If you like sour cream, then it’s fine here, just like it is on nachos. Some guacamole would have been nice instead, and it would have had a similar texture. The Nacho Fries become messier and messier as I went along and looked pretty gross as I was finishing. Nachos are never exactly an aesthetically appealing food, but with everything combined and congealing at the bottom of the plate, it was not pleasant to look at. When eating, I made the mistake of not eating the fries fast enough. I’m a slow eater in general, plus when I eat for the blog, I need to take notes and pictures as I go along. However, under the weight of all the toppings, the fries got soggy very fast. My recommendation is that if you order the fries along with other food, eat the fries first. The fries were more filling than I anticipated from initially looking at the container. Granted, before this Taco Bell order, I had eaten Burger King’s Flamin’ Hot Mac n Cheetos, but I still think these serve as a solid base for a meal. The summary of the experience here is good and bad. It was a good first effort by Taco Bell on the fries front. The fries were acceptable, if not great, and I feel like the base components of the fries, Nacho Cheese Sauce and ground beef worked well together and provide a solid foundation from which to move forward. The biggest negative is that the fries got soggy very fast. Even the fries that weren’t under a mountain of cheese and beef lost their crispiness fairly quickly. Unless you’re fine with soggy fries, these need to be eaten immediately. I wouldn’t even recommend ordering them at the drive thru at this point. After the fries lose their crisp, it’s a big soggy mess. I’m not sure if they need to fry these twice or if the sogginess is from a lack of quality, but they need to work on building a stronger fry. Also, I don’t think this was a good value at the price. I must have misunderstood the commercial, because I thought it was available with chicken or steak. At the price point offered for BellGrande, I expected one of those meats. Ground beef as the only meat option was slightly disappointing. It’s also an easy fix. Chicken and steak would add another texture and really make the taste better while also reducing some of the mess. Taco Bell already sells those meats, so it’s just a matter of adjusting the pricing. I offer a qualified endorsement here. Taco Bell has laid the foundation for future success with some small tweaks. If you’re excited like me to try the new addition to the menu, then it’s definitely worth your curiosity. I trust Taco Bell to make improvements to make these even better in the future. Taco Bell, along with Jack in the Box, have done the heavy lifting in pulling fast food chains towards more inventive fare. They had the Doritos Locos taco. Their breakfast menu changed the fast food breakfast game. In short, they’re always looking to push the envelope and see how far people can go. Sure, some of that is pandering towards millennials and looking for that perfect Instagram/Snapchat worthy food, but there is a certain nobility in going crazy and seeing what tastes good, as opposed to ideas that need to be sent to the glue factory. 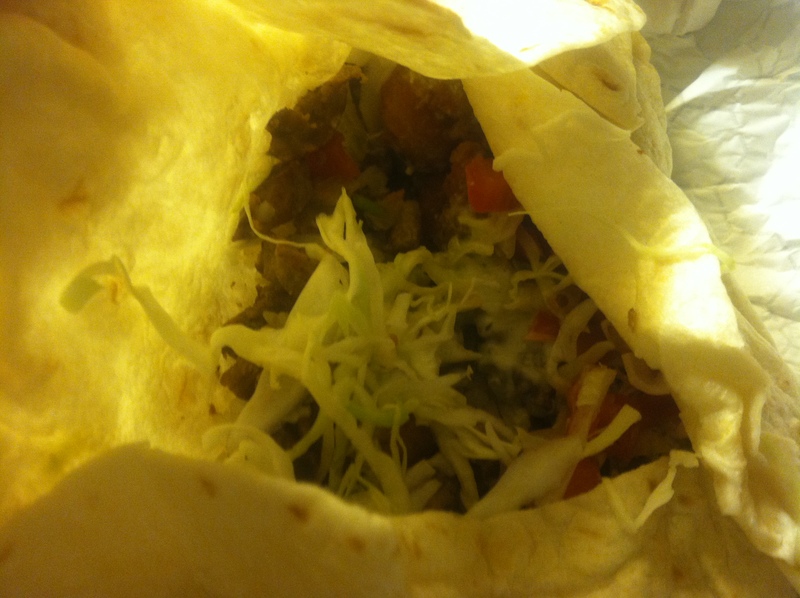 There is no Whopperito, without Taco Bell, and do we want to live in a world without the Whopperito? Instead of going upmarket and seeking to cater to a more health conscious clientele, Taco Bell doubles down on what they know best. That being said, I was happy to see commercials for the new Cheesy Core Burritos, giving me an excuse to head to Taco Bell and get some solid #content for the blog. The Cheesy Core Burritos come at three price points, depending on your choice of protein: $2.29 (ground beef), $3.09 (chicken), and $3.29 (steak). You can also get a box for $6.39 which includes a Cheesy Core Burrito, Doritos Locos Taco, crunchy taco, and soda. 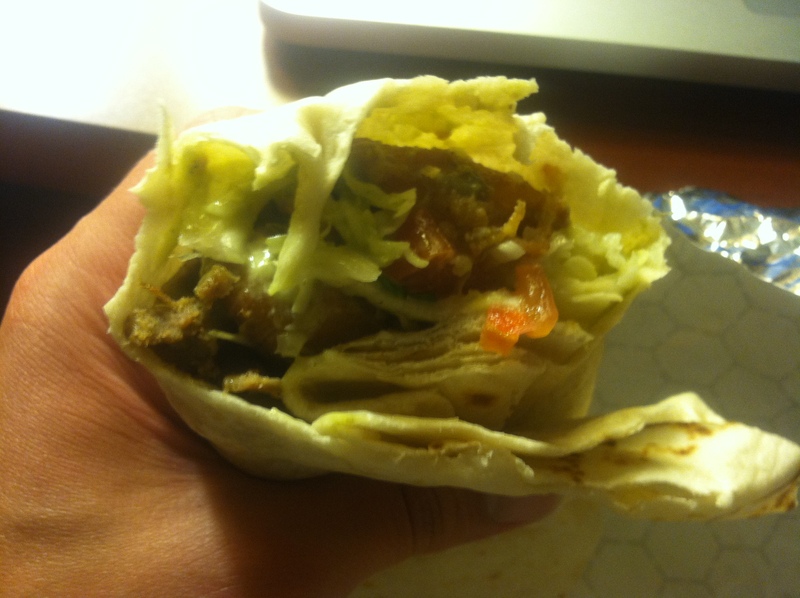 I opted for the ground beef individual burrito, since I was eating two… and going to Burger King after this. In the interest of full disclosure, I also ordered a crunchy taco, which was delicious but completely unnecessary (Taco Bell also has a new Diablo sauce, which seems to have replaced fire. I’m not a fan. It tastes bitter.). Taco Bell describes the Crunchy Cheesy Core Burrito as “a warm melted 3-Cheese blend, warm Nacho Cheese sauce and Crunchy Red Strips. With a melty, cheesy center surrounded by Seasoned Beef, Premium Latin Rice, Reduced-Fat Sour Cream and a flavorful Red Sauce.” Yes, they did capitalize all those words. 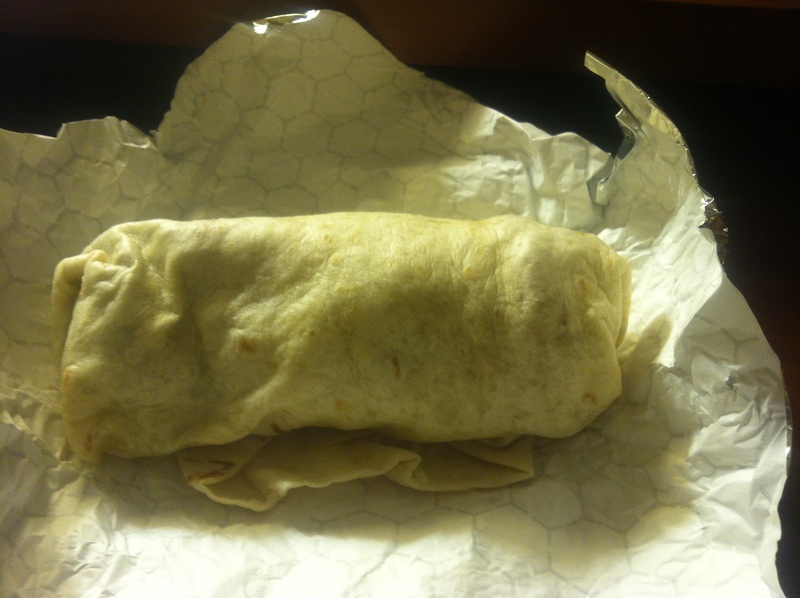 My first reaction upon picking up the burrito was realizing that it was pretty hefty. Then I looked at all the food in front of me and realized I’d committed to consuming way too much in such a short time span. Never say I’m not dedicated. Anyway, this looked and was sized like a normal burrito you could get at any normal Mexican place, i.e. not an enormous way too big for one sitting Chipotle burrito. A sensible portion. 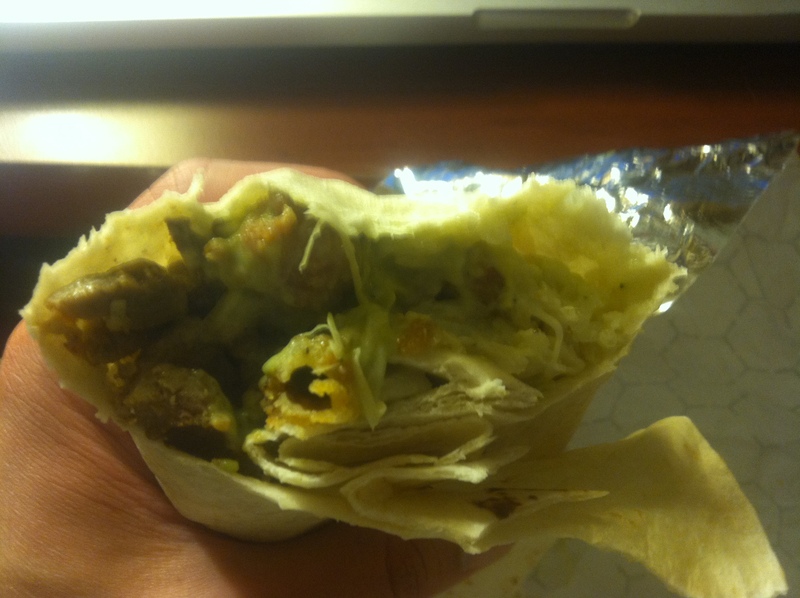 My first bite was all tortilla, which is a terrible first impression, but also typical of Taco Bell burritos so it wasn’t surprising. 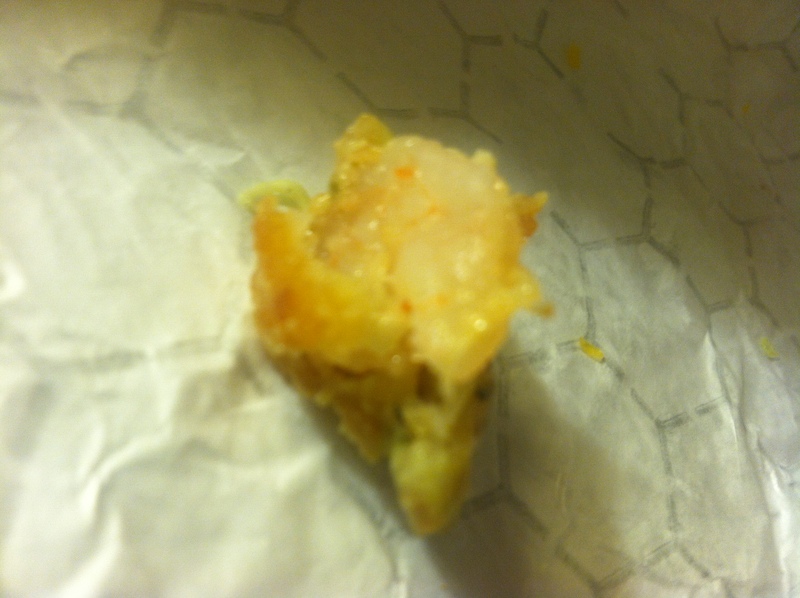 The Crunchy Cheesy Core Burrito also had the common issue of improper distribution of ingredients. It actually felt like two different burrito experiences: half had all of the toppings, and the other half was just tortilla. I’m not sure if this meant that the tortilla was too big, or just a poor wrap job, but I wouldn’t have been pleased if this was my main food of a meal. Moving on to the actual taste, when I took one of those bites with all the fillings, it was good! The red chips are the differentiator between this and the Spicy Cheesy Core Burrito, and they make a huge difference. Because a burrito can run into the problem where everything has the same general texture, having the chips to provide crunch breaks up the monotony and works really well. I also made sure to eat this first, so the chips would not get soggy. If you are a slow eater, soggy chips will be a problem towards the end of the Crunchy Cheesy Core Burrito experience. The problem may have been exacerbated because I paused between every bite to take notes. As for the rest of the burrito, there was a lot of cheese and rice in here. Rice is a natural filler, and it was fine, if a little bland. I like rice in burritos though, so as long as it doesn’t taste bad, then I’ll view it favorably. For the cheese, I really only tasted the Nacho Cheese. As someone who is a fan of Nacho Cheese and thinks it should appear in more menu items, I liked it. I’ve never had it in a burrito before, but now that I’ve experienced it, I would not be opposed to seeing it again. The cheese gave the most flavor to the burrito because it’s in every bite. It also dominated because it seemed to be light on ground beef. I couldn’t get many composed bites because there was ground beef at the top, and at the bottom, but not really in the middle. As mentioned before, bites with all the ingredients were good! There were just too few of them. There was sour cream. I’m not sure why, and I don’t think it was necessary. I also made no note of the “flavorful” red sauce, so I have no comment. The Crunchy Cheesy Core Burrito is basically a standard Taco Bell burrito with extra cheese, so if you’ve eaten one before, you already know if you’ll like this or not. Taco Bell isn’t exactly reinventing the wheel by stuffing some more cheese and some chips inside a burrito, but I’m not complaining; it hit the spot. While I wouldn’t say one of these made me full, if you order the box or get some more items to go along with it, I think you’ll be happy. The only real complaint is the composition of the burrito, but that’s a general risk when ordering a burrito. This post begins my transition from the west coast back east. The unfortunate aspect of this move, blog-wise, is that there are less fast food options in my current location, as well as fast food outlets not being as convenient (can you believe there’s no Taco Bell within a 5 minute drive?!?!). On my drive across the country, of course I was on the lookout for new places/things to eat, which led me to a Del Taco drive-thru in Flagstaff, Arizona after midnight. I’d only been to Del Taco once before, and that was sometime in 2006 in Colorado, so I had no clue what to expect. 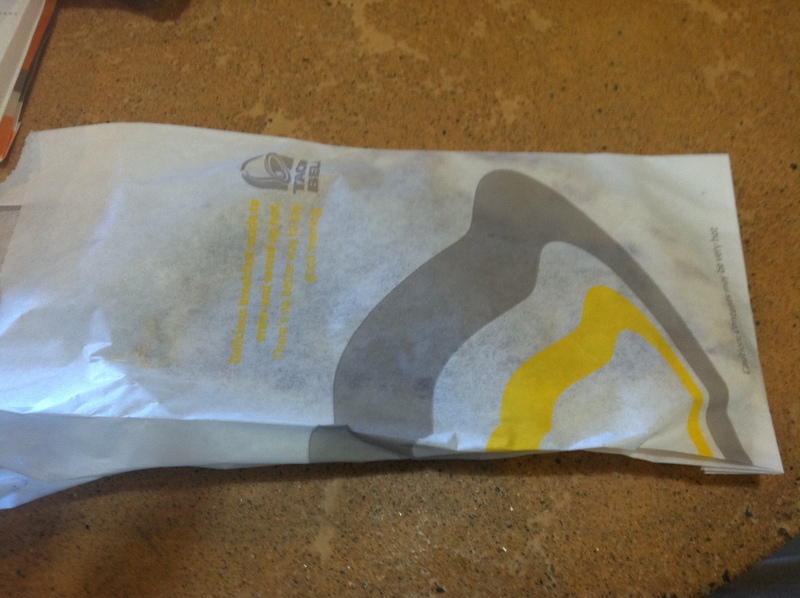 I remembered a competent fast food taco, but nothing that would make me forget Taco Bell. Scanning the menu for new items, I came across the Surf and Taco Burrito. I knew immediately that I had to eat this. Unfortunately, I did not save the receipt. Luckily, the Del taco press release states that the burrito cost $5.29 a la carte, or $6.79 as a meal, which comes with a medium soda. Unfortunately, it appears that they no longer offer this item. However, expect a price around there if it ever makes another appearance. Quick note before we begin: since I ate this so long ago, it’s not quite as cohesive as normal posts. I’m just following my notes, so this post just mirrors my eating experience in the order in which I wrote things down. The Surf and Turf Burrito “is loaded with crispy golden shrimp, freshly grilled carne asada steak, lime rice, crunchy cabbage, and is topped with creamy ancho sauce, freshly chopped pico de gallo salsa and Del Taco’s secret sauce.” Let’s unpack this, shall we? Coming out of the bag, the burrito smelled good. I’ll admit it was late and I was hungry, but smelling it really put me in a good eatin’ mood, and that counts for something. It also looked pretty damn big. Del Taco says it weighs between 13-18.5 ounces. I have no clue where it landed on that scale, but I knew I was going to be full after eating this (and several tacos I got on the side). Last note before we go into the taste: I ordered this late at night, and it sat for at least 15 minutes between being handed to me, and my eating, so keep in mind Del Taco may not have put its best foot forward on this item. The first few bites were just tortilla. While it did smell good, it was a little much and I wanted to get to the filling. Also, it was lukewarm, but, once again, it had been sitting. The shrimp were surprisingly not bad for fast food shrimp! They were clearly frozen, but they didn’t taste fishy or foul. 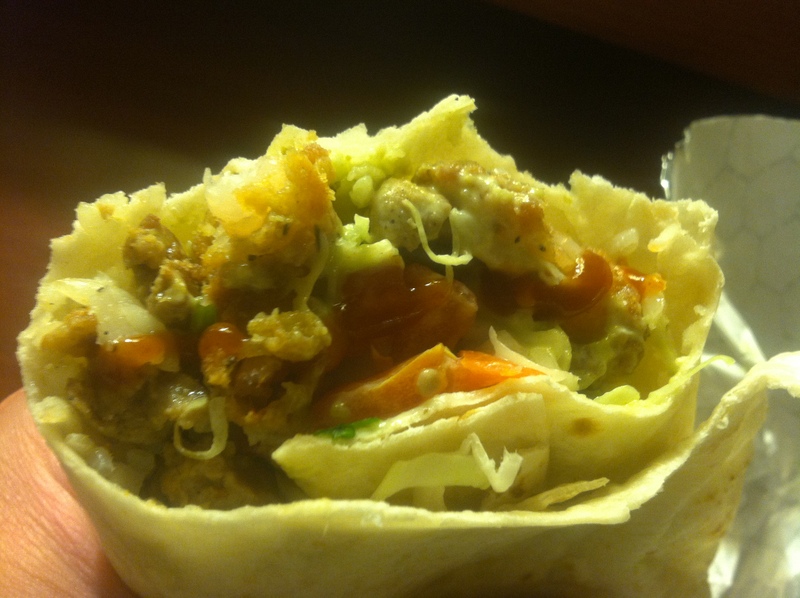 The batter stayed quite crispy inside the burrito, which is quite a feat. Also, the batter had some actual flavoring and a little spice, which was a nice touch. As I continued eating, I got some sauce, and it was not good. It tasted biter. I’m still not sure if this was the secret sauce, or perhaps the cabbage overwhelming other tastes. Anyway, when I got to eat the shrimp and beef together, it was a nice combo. Surf and turf! Who’d have thought it would work that well together? However, there were too many bites with only shrimp, beef and tortilla. Yes, we have an ingredient placement problem. Most burrito places can’t get this right, so it’s not like this is a special Del Taco problem, but we need an organized system for placement of ingredients in burritos. I shouldn’t have one meat bite, one veggie/sauce/guac bite, and one rice bite as I eat a burrito. They need to be mixed together. Rant aside, let’s get back to the beef. To be honest, upon viewing the beef, it looked a little sickly and kinda gross. The taste was much better than the beef appeared. 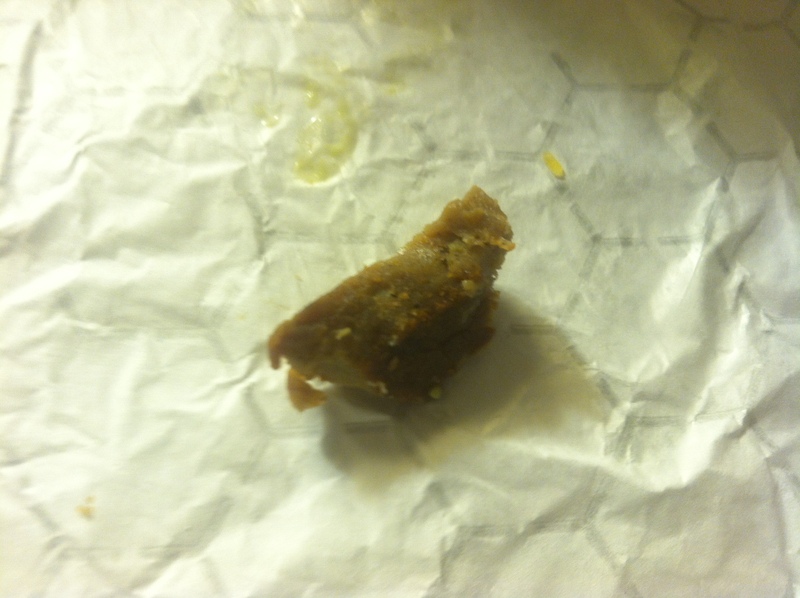 It also had a little spice on it (pepper), and it wasn’t too chewy, frequently a problem with fast food steak. At this point, I also started tasting a hint of lime, which added some freshness to a burrito where I know almost all of the ingredients came out of the freezer. I should say that no matter how I feel overall about this burrito, these small touches that Del Taco added really added to the experience. Things like seasoning the meat/batter so they can be tasted and squeezing some lime on top are touches overlooked by most fast food establishments, so they are definitely noticed when applied. Getting back to that bitter taste, about halfway through, I came to the conclusion that it was the cabbage. Not sure if this was a bad batch, or if it was supposed to be this bitter, but it wasn’t good and I started picking it out to avoid the taste. I decided to add some ‘Inferno Sauce’ to see how it would pair with the burrito. It was good… until my tongue and lips started burning. Definitely hotter than Taco Bell’s Fire Sauce. I thought this was going to be a regular hot sauce, not a death sauce. I had to take a break for my taste buds to recuperate before I could continue eating. The rice was meh. It was there. I saw it and definitely took bites from those areas of the burrito, but I never tasted it and there wasn’t enough of it in quantity to overcome the lack of taste and force me to pay attention. This disappointed me since I like rice in burritos (yeah, I said it). The pico de gallo suffered from the same problem as the rice. I never tasted it, so it was just there, taking up space. I also never individually identified the sauces, so I have nothing specific to say about the secret sauce, nor the creamy ancho sauce. In conclusion, we have a pretty good burrito here! There was more beef than shrimp, but it’s not like they skimped on the shrimp, unlike the El Pollo Loco shrimp experience. Also, while this burrito isn’t cheap, as far as fast food goes, you probably need to pair it with something else to be full satisfied. I ate it with two tacos, which was probably a bit much. I think one would have sufficed. The burrito was well wrapped and didn’t leak out sauce, so you could probably even eat this in the car. I can’t comment on whether I would eat this again since I don’t like near a Del Taco and have no experience with most of their food, but this was a good burrito, and I hope Del taco brings it back so more people can give it a shot. 1: A.M. Crunchwrap: One of the unique Taco Bell options, and the best tasting. A meal unto itself. 2: Waffle Taco: If this ranking was based solely on taste/experience, the Waffle Taco would be towards the bottom. However, the concept is fantastic, and if they work out the issues (i.e. make it correctly), this has the potential to be #1. The top two are clearly head and shoulders above the rest of the items. They’re unique to Taco Bell (at least amongst fast food establishments. I’m sure someone has made and serves a waffle taco) and different from everything else on the breakfast menu. These last items, are interchangeable, in addition to having glaring flaws in their original form. While the flaws can be fixed (sauce! ), they are apparent, and there’s no special reason to go to Taco Bell for any of these items. 3: Breakfast Burrito with Bacon: This really isn’t much different than the Steak & Egg Burrito. IT supposedly has a double portion of eggs and contains a non-premium meat. Thus, the lower price point. Because I’m usually not hankering for steak in the morning, I ranked this higher, but they’re essentially interchangeable depending on your meat preference. 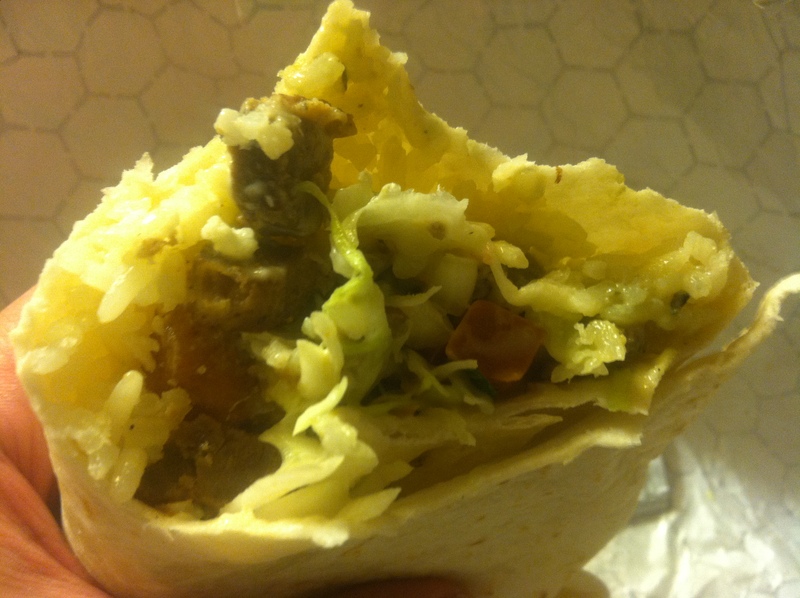 4: Steak & Egg Burrito: See above. 5: A.M. Grilled Taco: Nothing special here, but I like the combo of eggs with sausage and cheese, plus the tortilla wasn’t too heavy for a morning snack. 6: Sausage Flatbread Melt: Mine was a little overdone, which didn’t help matters. I just don’t see myself eating this again. It’s heavy and boring and dry. And here were the hash browns and Cinnabon Delights, which were reviewed but aren’t really comparable to the above sandwiches. I hope you enjoyed this series as much as I had eating/writing about it. Next up will be a McDonald’s burger that I ate four months ago but is still being touted as new! I was going to lead this off with some lyrics from The Doors “The End,” but that seems a little hacky, right? I’m glad I held off. Anyway, the time has finally come. I have reached that oasis on the horizon which has been taunting me for the past three plus months. This post will complete my running series on the Taco Bell breakfast menu, allowing us to finally move on into new territory. 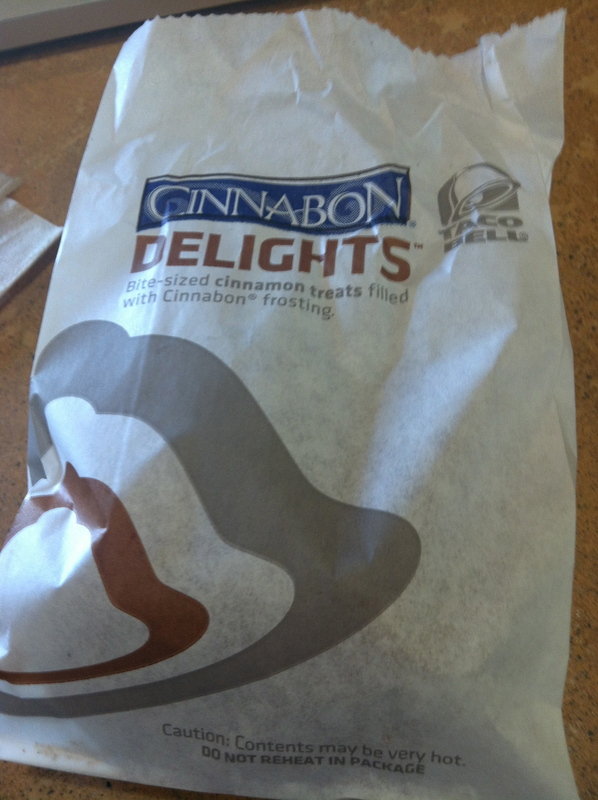 These are exciting days my friends, so join me as I recount my experience with Taco Bell’s Cinnabon Delights. Unlike the last one, this post features photos! 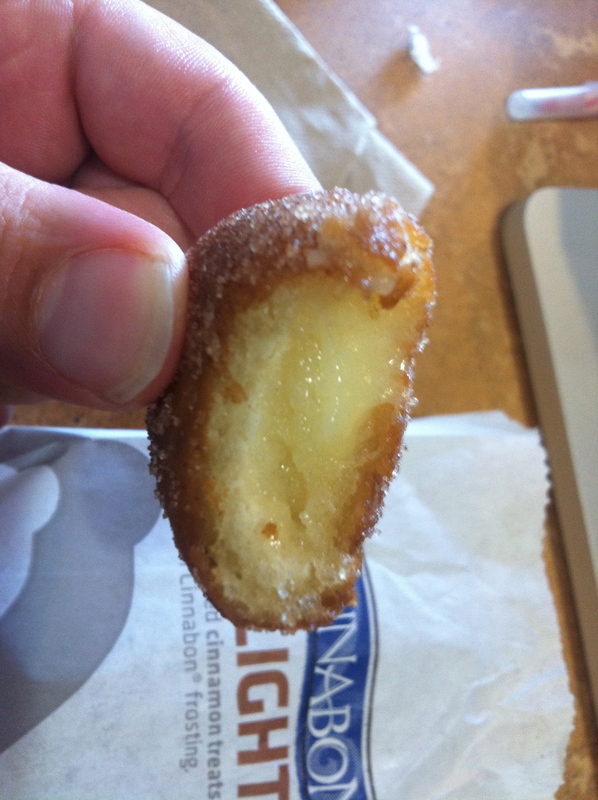 Cinnabon Delights are available on their own, or as a compliment to a meal. With a meal, you can have two of these delightful balls instead of a hash brown. If you order them on their own, they come in packs of two, four and twelve. Slightly kidney shaped, but look at that sugar. 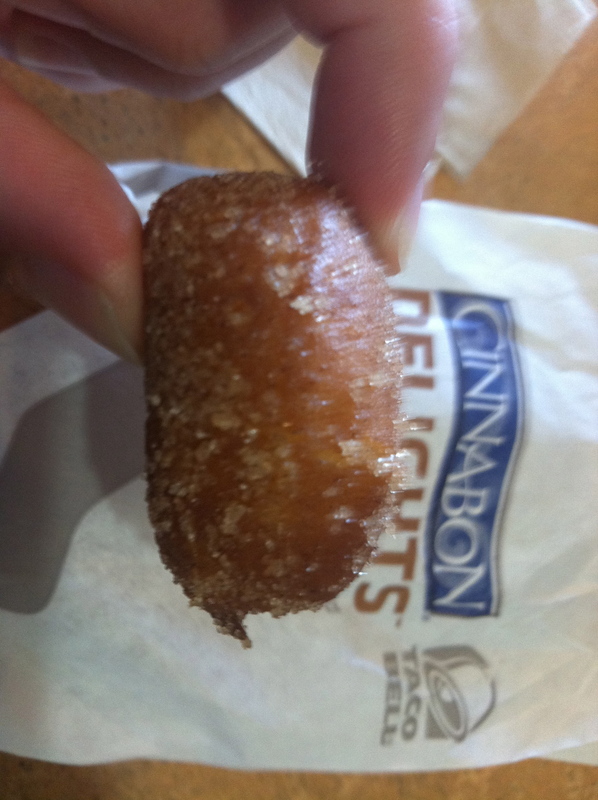 Cinnabon Delights are “warm, golden bite-sized pastries filled with Cinnabon frosting and covered with Makara cinnamon sugar.” Think warm cinnamon Munchkin/donut holes with frosting in the middle. Does that make you happy? Because it should. There’s not much to analyze here. These were tasty as hell. The frosting was great, and didn’t ooze out. There was a good crunch to the Delights and the cinnamon sugar (excuse me, Makara cinnamon sugar), mixed really well with the frosting. As with the hash brown, these were eaten last, but even after sitting for twenty minutes, they were still fantastic. The only downside to these is that they’re a little heavy to be eating in the morning. Luckily, as an intrepid food blogger, I planned this meal so I had nothing else to do that day, so my laziness/food coma didn’t prevent me from engaging in any activities. While I generally prefer hash browns/fried potatoes as my side, if you’re only going to Taco Bell for the novelty aspect of their breakfast, do yourself a favor and get these instead of the hash brown (besides, you’ll already be having a hash brown in your crunchwrap). For the sake of completion, now that we’ve run through all of the sandwiches on the Taco Bell breakfast menu, I figured I may as well do quick posts on the sides. First up, the hash brown! In case I haven’t mentioned this before, I love fried potatoes in all forms and the fast food hash brown, when done right, is a great disc of crispy potato goodness. Taco Bell’s retails at $1 (once again, using Google for that price), which is actually pricy for a hash brown. I seem to remember McDonald’s offering two for $1, though I can’t currently say if that deal is still on the table. Regardless, this is a decently large hash brown, and if you don’t want to pay $1 for it, it is an option as the side when you order a breakfast meal. Taco Bell PR really let me down with this description. All we get is “a crispy, shredded potato patty? !” No flowery language, describing the virtues of the potatoes, or how its fried to a perfect crisp and is a perfect compliment to a meal or snack on the go? For shame Taco Bell! Hash browns deserve respect! Now that I’ve defended the honor of hash browns, how about I actually talk about the eating experience? One of the downsides of ordering so many foods at once is that some things wind up sitting around for a bit before they can be eaten. I’ll be reviewing the hash brown on a curve because it sat in a bag for fifteen minutes before I could eat it (Fast food tip: if you like crispy non-soggy fries but they need to sit in a bag before you can eat, open the top of the bag and ensure that the fries are under the opening to let some of the hot air escape. They won’t be as hot as possible when you eat, but the ventilation prevents them from becoming a disgusting soggy mess). The hash brown smelled fantastic, which reminded me of McDonald’s, which is my standard for best fast food hash brown. 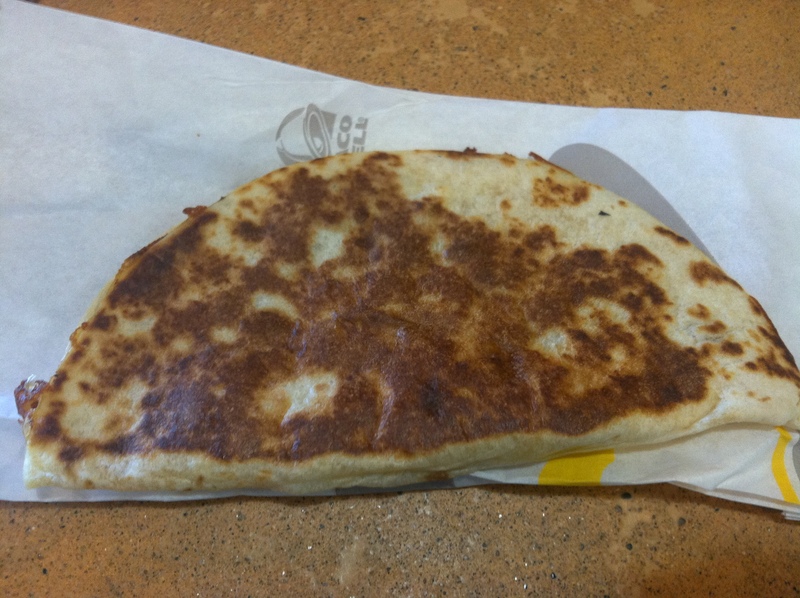 As I mentioned in the AM Crunchwrap post, this was a broader, flatter hash brown. This allowed for more surface area for crunchy batter, so I’m not complaining. And it did remain crunchy even after sitting for fifteen minutes. Luckily, even with it being flat, it still retained some potato taste. It could have used some salt, but that’s my only complaint here. This is a solid hash brown, and it definitely will be the side item I order for any future Taco Bell breakfast purchases. 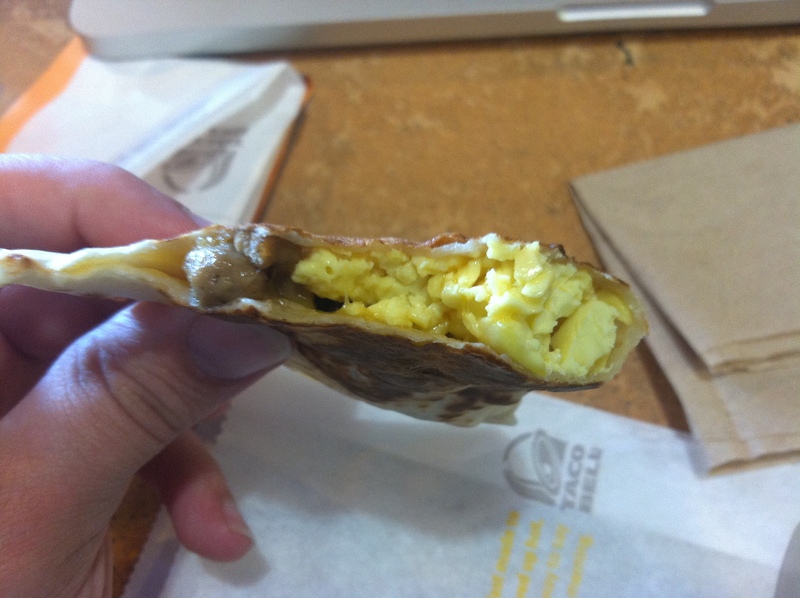 Slowly, but surely, we’re completing this journey through the Taco Bell breakfast menu. We’re finishing the sandwich portion with the simplest item they offer: the A.M. Grilled Taco with sausage. 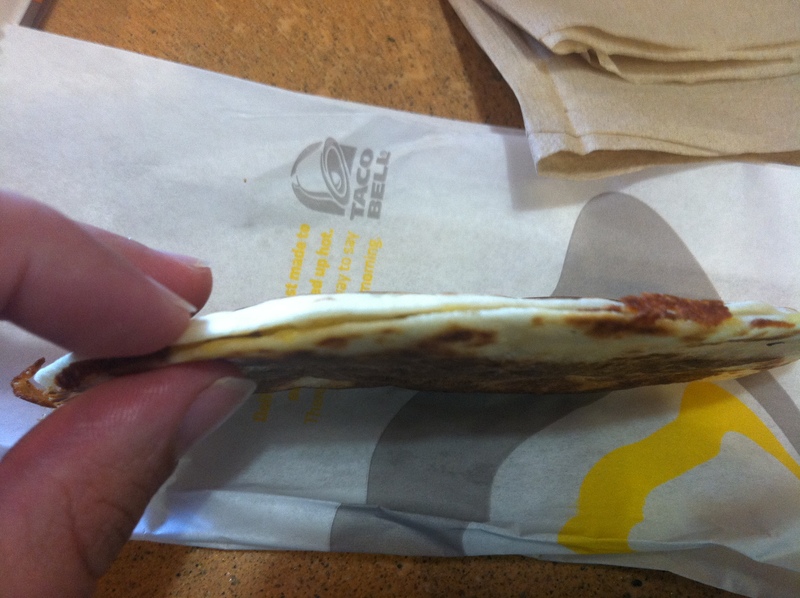 Upon first glance, this looked like the flatbread melt, except slightly smaller. It’s priced at $1, and also falls into the value menu option for breakfast. Taco Bell describes the A.M. Grilled Taco with sausage as “fluffy scrambled eggs, melted cheddar cheese and flavorful sausage crumbles folded in a warm tortilla and grilled for portability.” Normally, I don’t spend too much time on the food description, but since this whole review is not covering much new territory here, let’s analyze this a bit. First, this whole menu is designed for portability, so I’m not sure why the taco is being singled out here. Other than the A.M. Crunchwrap, everything can be eaten whilst driving. Even weirder, sausage crumbles? Really? I don’t think of sausage as something that can crumble, and if I encountered crumbling sausage, I’d likely want to avoid eating it. Just call them nuggets or chunks! Anyway, random tangents aside, let’s talk about taste. The taco was layered so that the egg and cheese were at the fold, with the sausage on top. This is the proper sandwich construction. I note this only because there was some crazy confusion in the kitchen after I placed my order, and based on my eavesdropping, it was centered around how to make this taco. So I doff my cap to the manager who straightened things out back there. The tortilla was left in the press too long, so the slightly burnt flavor dominated my first few bites, which didn’t have any sausage anyway. When I got some sausage towards the middle, this tasted better because the sausage crumbles had the most flavor. However, once again, a lack of sauce dooms the taco. It didn’t really become good until I put some fire sauce in there. So this is another breakfast item that’s too dry on its own. I’m really having a hard time understanding how Taco Bell green lit so many items that were dry. Are they just banking on everyone using sauce? If so, maybe say something, as opposed to leaving anonymous bloggers such as myself to question your sandwich design skills. The real comparison here is between the A.M. Grilled Taco and the Sausage Flatbread Melt. The flatbread was more filling, due to its size and the inclusion of a sausage patty, and not crumbles. But… this was less of a gut bomb because there was less bread. I don’t see myself ordering either of these items again, but I probably lean towards the taco.